Hello All and greetings from Blacksburg VA. I am a proud and happy owner of a beautiful 1976 2002 that I bought this past Thursday. The previous owner, Matt Oljeski of Charlotte made the whole transaction a breeze. I drove from Blacksburg to Charlotte, and drove the car back with absolutely no issues. It was my first experience driving an 02 on the freeway, but a very interesting one. It was unrealistically loud. Not the engine, but all the other little things, which I plan on fixing in the next few months. It is a great car, I think, with the usual vent holes created by its age and mother nature. That is the first order of business on my list. My first Motorcycle was a 1969 Royal Enfield and I still ride it every summer when I go to India. In the past few days, I have done about 300 miles in my new car, and loce it so far. This morning, the clutch pedal felt empty, and once I got the car out of the driveway, I was not able to engage any gear. Checked the brake fluid reservoir, and It was half full. Once I filled it back up, after pumping the pedal about 100 times, the clutch felt normal, and so far it has been doing allright. I will keep you all posted on the progress or floor pan repair. Oh, by the way. Matt is a really cool guy, and I hope he buys another 02 really soon. One last request, is it possible to buy the spare wheel pan, and just replace the whole thing, as I only have half of the tub, the other half is rusting in peace. I believe OEM sheetmetal replacement spare tire well pans are available. Also, one from a 3-series may be able to better accomodate 14" or so wheels, just in case. Check realoem.com, and contact BLUNT on this board for oem parts. Welcome, to the madness, from a nuther VA '02er! Are you affiliated with Tech? I am in the Massanutten Resort/Harrsionburg area. Make plans now to attend Vintage at the Vineyards. I actually teach at Tech. I teach in the Industrial Design Department, which is part of School of Architecture + Design. Stick a pencil or something similar down in the pedal box and see if the brake fluid is in there. Check the lines to see if they are leaking or the rear cylinders. I recently had to replace lines and cylinders, because they were leaking. And oh yeah check the ground where you park. I did check the ground and not a single drop. Tomorrow I am going to stick the pencil in the pedal box. The transmission shifts OK except the second gear, even that is not bad if I shift when the RPMs are still high. I have had this car for not even a week so far and Already love every aspect of it. I plan on keep driving it regularly for at least two more months before I sell my 535i, which I loved till I saw the 02. Great news! I am in Floyd County with two project 2002s and other BMW stuff. I look forward to you visiting my house with your car. I would be happy to help, if you are willing to help me, even though it might be the blind leading the blind. But the 02 group is a tremendous source of help and knowledge, so make sure you join. I know I will be needing them! Definitiley put V at the V on your calendar. I f nothing else, that makes two guys who want to fix things but have no experience, at least in my case. It will make a huge difference I think just to have another person to bounce ideas and compare notes etc will be great. I am an assistant professor at Tech, and have already met a couple of guys here who seem to know these cars inside out. Hopefully we will be able to meet and share the issues soon. Thanks a bunch for the note. sounds good. cell is 703-980-1537. yep, it is a NoVa number, but I am really here. I just bought the 76 last week in Blacksburg. 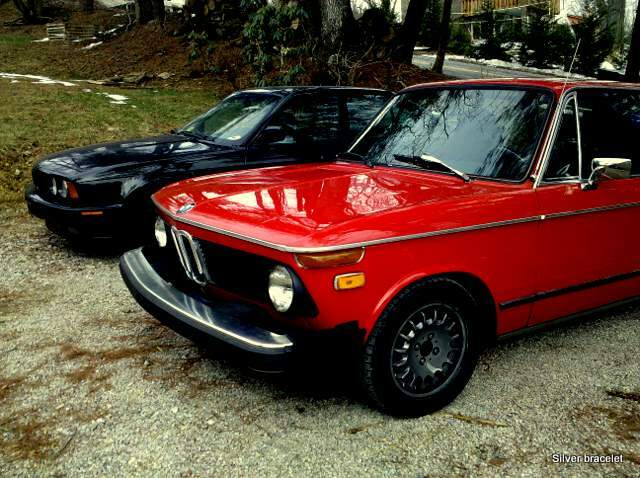 I had a '71 from 77--83, and a parade of BMWs since. this will be the first restoration project, however. Glad to have an ally nearby. Did you get the one on craigslist? I almost bought the silver car. The body was in great shape but it needed lot of work right away. I have seen another one near smith mountain lake, and may be we could buy that car as a parts car. It has lots of good parts. I just got my hands on a wire fed welder, and we should definitely get together and start patching up things.